Get your wallets ready! Macpower Marketing Corporation, the top distributor of high-end gadgets accessories here in the Philippines will have its Pre-Christmas SALE on October 12 to 14, 2017 from 10am to 8pm at Titanium Room, F1 Hotel Manila. Enjoy special deals and discounts up to 80% OFF on your favorite products like Boompods, MB Quart, Runtastic, Homido, Rhinoshield, Belkin, Manfroto, Natgeo, etc. 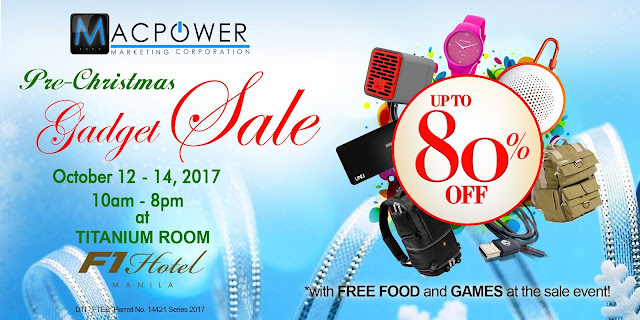 Those who register online will receive an email discount coupon which they can use to avail the latest accessories, and a chance to win buffet meals and overnight stay at F1 Hotel in BGC.